“Breaking Bad” is the closest thing to must see TV that exists during a time where seeing a program live doesn’t really matter to most people anymore. While watching it live is not mandatory, it is certainly an event. To me, watching live television has often felt like finding out some amazing secret before anyone else does. And finding it out at the same time as a certain chunk of the country that I’ve never met before felt like a strange bonding experience. This right there is the beauty of television, and with TV changing so rapidly, “Breaking Bad” deserves to be the poster boy for a new era. It earned it long ago, and it certainly looks like it has no intention of ever giving that title up. It is not earned by Nielsen ratings, but rather by pure quality. Just like Walter White, it has crushed its competition just by being the best at what it does. This past Sunday’s episode, entitled “Say My Name,” was the culmination of Walt’s infinitely expanding ego, which has been on the fritz since he first uttered “stay out of my territory” in season two. “Say My Name” began with Walt making the deal that would get his two business partners (the brain trust) out of the business for good. But for Walt, no deal could go down so easily. He told the man who tried to rip off his product that he had to say his name. With confusion yet no hesitation, the man answers “Heisenberg.” It seems like something a smug psychopath would say before murdering someone. But as we found out last week in his soliloquy about his employment history, Heisenberg really needs the validation. And he could go home happy, knowing that he is still the greatest cook in America. But, as the therapist he never had would probably say*, he made some great strides when he gave Jesse some credit for their blue meth creation. And of course, Jesse responded with a simple, modest grin. The unpredictability of “Breaking Bad” that I have always talked about showed itself well this week. “Breaking Bad” is a slow burning kind of show. Every episode moves along at a creeping pace and by the end, either nothing significant or a game-changing turn of events will occur. And then when the moment comes that you realize something major is about to happen, it is absolutely terrifying. “Breaking Bad” plays off of the ability to either be totally predictable or unpredictable better than any other show I have ever seen. Perhaps the most surprising part of “Say My Name” was the way it turned Walt into someone we haven’t seen in a long time. Even after committing what is quite possibly one of his most atrocious acts ever (competing with poisoning a child and letting Jesse’s girlfriend choke on her own vomit), there was a flash of the old Walter White there. Heisenberg, the man who never hesitated in pulling the trigger, seemed to vanish momentarily. The man who just wanted to protect his family may still be alive underneath all of that evil. But as much as this episode and every single one before it is most importantly about Heisenberg, this episode will forever be notable as the last appearance of Mike (unless we are treated to flashbacks). Mike, the only one who really knew about drug distribution, was always memorable in earlier seasons as a great minor player, but this season he flourished with much more screen time. 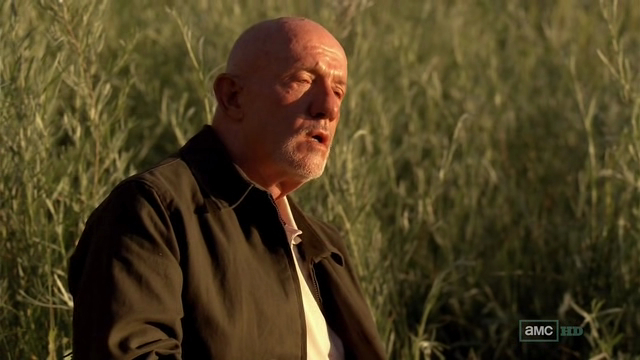 The fact that I nearly shed a tear as Mike died is a testament to how good “Breaking Bad” is at making bad guys likable without necessarily making us root for them. While Mike’s death could have been dramatically over-the-top, it was rightfully toned down. The fact that his body falling is indicated only by a shaking bush in the foreground shows that in this world, people move on quick from death. One chess piece topples another. Or in this case, one chess piece may have toppled itself. Mike’s motive for killing himself remains unclear. I wouldn’t be surprise if it was his way of sticking up his middle finger at Walt one last time by not giving Walt yet another reason to boast. As Mike, Jonathan Banks scored a very high note so late in his career. It is a shame he never got any bigger roles before this, but his best days seem yet to come. “Shut the f**k up and let me die in peace.” There is no other way Mike could have left this world. *You couldn’t pay any therapist enough money to take Heisenberg as a patient. -That moment when Saul opens up a drawer filled with cellphones made me realize there are so many more stories to tell with this character than I ever imagined. Let’s make this spinoff happen. -The Breakfast King was absent this week. -The opening scene marked the return of the music which has graced multiple showdowns that Walter has gotten himself into. Every time I hear that music playing, I get chills in the same way I do when listening to the score of a Sergio Leone film. -This may be Walt’s first showdown in the middle of the desert where he truly was the danger. -That final scene made me think of several great modern westerns, such as “The Proposition” and “No Country for Old Men.” It looked very similar to the river bank in “No Country” where Llewelyn was chased by that rabid dog. This entry was posted in Analog This, Breaking Bad, Bryan Cranston, Heisenberg, Jonathan Banks, Walter White on August 28, 2012 by ian0592.